Secondhand shopping is truly a learned skill. It takes a little persistence but once you get a taste of the thrift thrill, you can’t stop. However, shopping “the bins” is a completely different ballgame. You can find some serious gems digging through the bins. But it’s work. All thrift stores require a little patience and strategy but the bins call for a little extra elbow grease. “The bins” are exactly that. Bins of secondhand clothing, toys, electronics, housewares, books – you name it – at incredibly discounted prices where items are sold by the pound. 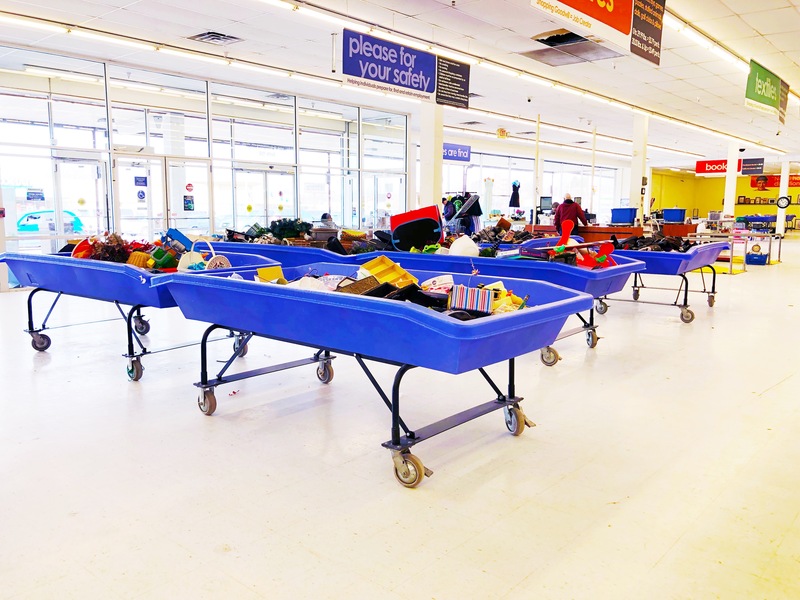 Some thrift shops have bins marked in their regular stores and some, like Goodwill Akron have entire designated “outlet” stores. Outlet stores or bins are usually the last stop before items go into the salvage stream to be recycled. Avid thrifters, families, and clothing resellers love the bins because of their deep discounts. In Akron, you can buy a pound of clothing for $1.39. Bring a pair of latex gloves. Sure, it’s weird to shop with gloves on but this isn’t a typical shopping experience. You’re literally digging through bins of stuff. I like to dig with one glove on and one glove off to spot quality textures like silk and cashmere. Make sure you’re dressed comfortably because this is work out! I always joke that I need a day to recover after digging at the bins. I like to approach the bins in two ways: some days I clear an entire afternoon to really dig and other times I give myself an hour to speed dig. 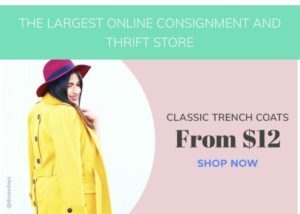 It all depends on how committed you are and how well you recover from thrift FOMO! Some people even camp out all day and wait for Goodwill to roll out a fresh set of bins. Bring batteries to test toys, measurement and measuring tape if you’re buying furniture, socks and clorox wipes to try on shoes. Most bins stores don’t have fitting rooms so make sure you have measurements and sizes handy. Most of the items are in excellent condition, they just need a home! However, always inspect the item front to back. I like to lay the item flat and check for stains and rips. Always check the seams and turn it inside-out. Beat the crowds. Go early or later in the day. Some places will tell you when they bring new bins out and others won’t. Find out if your store is willing to share this golden nugget of information. This is a funny little trick I try when I’m too tired to dig, also because I’m really short. Some people are pros at digging and flipping items over to get to the stuff that’s at the bottom to the top of the bin. When they are done flipping it all over, I circle back to find a bunch of things I couldn’t reach at the bottom! Since you’re going to be digging through an entire bin of stuff for that one gem, it helps to seek a little inspiration beforehand. 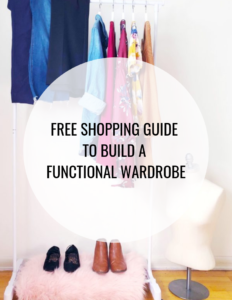 Knowing what kinds of prints, textures, colors are popular and speak to your style will help you filter through the dozens of unwanted items in the bins. It could be as simple as browsing through Pinterest or your favorite magazine. Often times you’ll find items that need a little TLC but it’s nothing a fresh coat of paint or new hardware can’t fix. Try your best to see the potential in some of these items. Use your phone to look things up on Pinterest. Take it one bin at a time, fold the items neatly in your cart so you don’t feel overwhelmed by everything piling up. Figure out which bins are worth a beeline and which ones are worth skipping over. For example, I head straight to women’s clothing and furniture first. I save housewares for last and skip over book. Before you check out, inspect the items one more time as you lay them on the counter at the register. Since bin and outlet items are already deeply discounted, most places won’t allow you to apply additional coupons or discounts. However, it’s worth asking! Check to see if there are special bin days or store specials. Make sure your smartphone is charged and you have access to the internet. Whether or not you’re thrifting to resell, it helps to have Google handy to look up the brand, fabric or even value of some items. I always do this when I’m thrifting, even at regular thrift stores. Wash whatever you can in super hot water. Use Lysol and Clorox Wipes for furniture, books, toys, etc. You can rent steamers from your local hardware store to deep clean soft furniture.